A little bit of planning and research can mean the difference between an average vacation and a magnificent one! Wander wisely in Aachen by knowing some basic facts about it before you venture off. Aachen sits 55 miles (89 kilometers) to the southwest of Duisburg, a well-known city. Approximately 270,000 people live in this area of North Rhine-Westphalia, so you'll have plenty of opportunities to make some new friends. With Travelocity, it's so simple to plan a trip to Aachen and save money. All you need to do is book an airfare and accommodation bundle. Best of all, with more than 400 partner airlines and 665,000 properties, it'll be easy to find exactly what you're after. Would you like a worry-free visit? Our Customer 1st Guarantee provides 24/7 personal assistance on all of our services. If you happen to notice a better deal somewhere else, we will refund the difference^. You're able to alter your getaway bookings with no hidden charges from us. You know what that means, right? Less stress for you! And so long as you get in fast, many accommodations don't charge extra fees either^. A memorable vacation is just a few clicks away with Travelocity. Choose from 23 accommodations in Aachen then start counting down the days until you leave! There's no better time to truly indulge yourself than when you're taking a vacation. 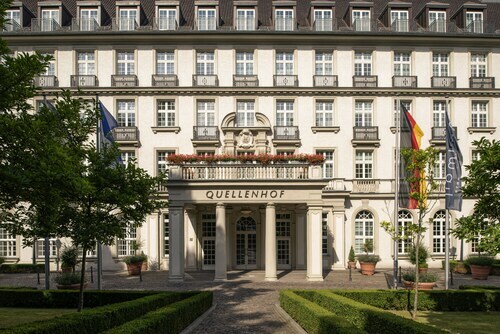 Lock in a room at the Pullman Aachen Quellenhof (Monheimsallee 52) and feel like royalty during your stay. Traveling on a budget? Not to worry, you won't be left in the cold. The a&o Aachen Hauptbahnhof (Hackländerstraße 5) will keep both you and your hip-pocket happy. Where do you fly into for Aachen? Put on your headphones and choose an in-flight movie. In no time, you'll be coming in to land at Maastricht - Aachen Airport (MST). It's 17 miles (27 kilometers) from the middle of Aachen. Can I rent a car in Aachen? Book a rental car with the help of Travelocity and get to know Aachen on your own time. Collecting a vehicle straight from Maastricht - Aachen Airport will mean you don't have to deal with cabs and transfers. Avis and Sixt are both a short distance away. Hertz is right in the center of the city. All you have to do is head to Bahnhofsplatz 2a. If there isn't anything suitable for you there, Europcar at Bahnhofplatz 2 An is worth looking into. A house of public worship and private times of prayer, Aachen Cathedral is a renowned holy structure. That being said, you don't need to be a church-goer to stop by this peaceful place. Like some more ideas? Eager to attend a conference or event while you're in town? Check the schedule at Eurogress Aachen and find something that piques your interest. But there's more. Wouldn't mind adding some deeper meaning to your travels? Make a pilgrimage to St. Nikolaus Church. No matter what your beliefs, it's a superb place to familiarize yourself with the local religion. Aachen is just 18 miles (29 kilometers) from Maastricht. 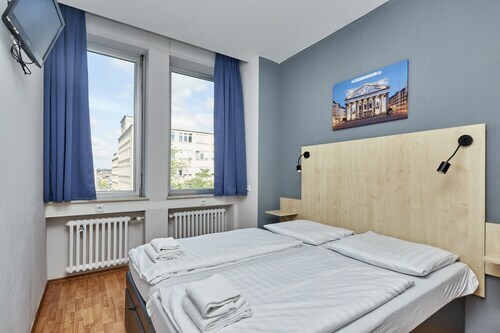 Use this place for easy access to a range of attractions, including the Natural History Museum and the Bonnefanten Museum. If you have the time, travel just 20 miles (32 kilometers) to Lanaken. This is another area featuring nearby unmissable attractions like Basilica of Our Lady and St. Servaas Church. 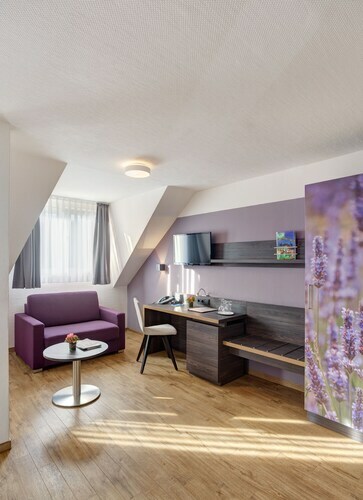 Situated in Aachen, this hotel is 1.1 mi (1.7 km) from Aachener Zoo and within 3 mi (5 km) of Aachen Cathedral and RWTH Aachen University. Marschiertor and Suermondt Ludwig Museum are also within 2 mi (3 km). Aachen-Rothe Erde Station is 27 minutes by foot and Aachen Central Station is 29 minutes. Located in the heart of Aachen, this hotel is within a 15-minute walk of Suermondt Ludwig Museum and Aachen Cathedral. RWTH Aachen University and CHIO Stadium are also within 3 mi (5 km). Aachen Central Station is 7 minutes by foot and Aachen-Rothe Erde Station is 20 minutes.